Hatch & Sons wanted to be a kitchen from the start. Heart of the house, source of sustenance, warmth and hospitality. A kitchen table is what they sat around discussing what evolved into Hatch and Sons and it remains central to what they do. All day dining of an informal and easy nature. 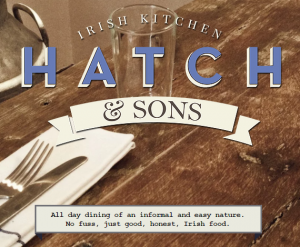 No fuss, just good, honest, Irish food. The name is from a dairy that existed in the late 19th century on nearby Leeson Street. Owned by two brothers, they subsequently bought an arable farm north of Dublin and raised beef cattle. With beef and milk being two key Irish ingredients the name is rather fitting. But its not just milk and meat from rapeseed oil to flour, from eggs, to the salad leaves they’ve focused on everything being Irish.